February | 2010 | Frank & Donnis Travel Blog "the more we see the more there is to see"
The other night I was watching a documentary on SBS Television. In part it was about the Swiss Alps and I recall the commentator saying “They say don’t go on…mountains”. Well, those few words set my mind off on a tangent and I started to sing, mentally. Then I sang verbally. an he’s might handy, with a gun and a knife”. Whew. Where did that come from? It must be from about 1960 or 1962 and I have not heard that song since… well, since about then. So it pops into my mind almost 50 years later and sparked off by a few words on a TV Documentary. I lost interest in the TV then and turned it off. And a host of other Ballad / Folk songs which were popular at the time and which I am not going to compile a list of here. I do find that often when people are talking to me, a song fitting their comments will pop into my mind. It happens on an almost daily basis. Saturday 2nd last day of February 2010. The last two days has been raining. Heavy at times and it has dropped the temperature and humidity. In fact I was able to sleep unassisted the last two nights. Assisted sleep means in an air-conditioned room. The Outrigger people are in town for the first North Queensland Zone event of the year. Once I was part of this competitive fraternity, paddling for the Sunset Bay Club. In fact I was President of the Club for 2 years. The sun has made a couple of appearances today and driven the humidity levels back up to intolerable. I thought it would be nice to get on the Virago and ride down to Airlie with the camera to catch a few action shots as well as to see if there are any die hard paddlers still being crazy after all these years. (now there’s another song – Neil Simon) The bike would not start. The battery is flat. So I had to pull the seat off to get access to the battery. I suppose I have not ridden for 5 or 6 weeks so a flat battery was not inconceivable. I have pulled it out and put it on the charger. It was lunchtime so ate while I pondered driving the car to the beach. Drove my car to Airlie but noticed a funny smell. Hmmm. Something dead, lizard perhaps? On the way home in a different light I noticed what is causing the smell. Because the car has been unused for near to three weeks the seats and other parts of the upholstery have grown thick masses of mould in the humid weather. Yuk! I was sitting on mould also. Now there’s another job. Nothing to see at the outriggers as the ladies marathon was in full swing and the canoes were somewhere off in the distance. I did meet three people still paddling from way back when. Groups of people lying around recovering from their marathon and others lie around conserving energy waiting for their marathon. Same old, same old. That was the worst part when the marathons were on. Sprints meant you were on adrenalins high all morning. Marathons you sat and waited or sat and recovered. Nothing to photograph but I have a photo from 2008. Outriggers jockeying for marathon start position. It is raining again. Unless I put on a raincoat and go outside and pull weeds I am confined to working inside. Sunday. Raining on and off. Humidity is WHEW! 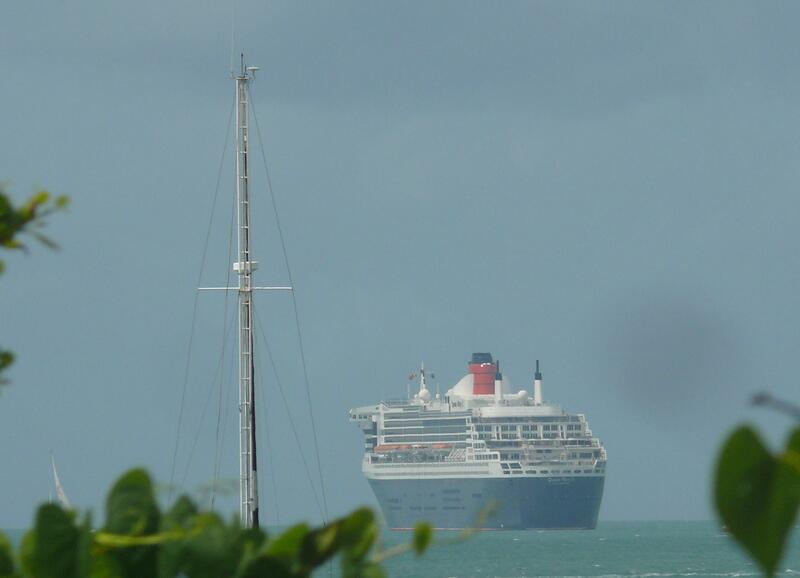 The good ship Queen Mary II arrived here this morning and is anchored off Airlie and it is mighty impressive in size. I tried to take photos but all the best vantagepoints have something in front of them. Also on full zoom it is difficult to hold the camera steady. Plus the wind is blowing directly onto the camera. Thankfully my Panasonic FZ 50 is equipped with auto “Shake” correction although it cannot perform miracles. Queen Mary II taken from the Coral Point Lodge Private carpark. My brother Allan and his wife Rae arrive on a cruise ship for a few hours next Saturday. I can send them the photos and say, “this where you will be parked” and “you will have mobile phone service”. Along with the humidity comes the mould growth. Inside the house, especially in wardrobes, the clothes and shoes not used frequently are growing a blue green colour. It smells damp and musty. Nothing else we can do but wait it out, perhaps wash all the clothes and bedclothes and pillows and blankets and curtains and towels. Shoes will need to be wiped over and cleaned and oh I am not looking forward to this. I thought the smell was coming from the T-shirt I am wearing. I have only worn it today and it is sweaty already. Alas it is not the shirt, it is not me it is the house. The motorhome is musty too so I will have to do the same thing inside there, including wiping down all timber surfaces and bench tops. Vinegar and water spray should do the trick. That’s my week drawing to a close. The beard needs a trim so see ya next week. Queen Mary II from Cannonvale Beach. Note the &^%* raindrop smudge on both photos. Remember to click on any photo for a full size version. It has been a wet week with rain every day, sometimes all day. Sometimes it rained heavily. Of course the humidity levels have been in the “unbearable” range all week. I have spoken with Donnis by telephone almost every day. She has managed to shake off the flu and sounds so full of life again. She has visited her Mum in a nursing home every morning this week. It was exciting that the Australian woman, Torah Bright, won our first Gold Medal in the Half Stovepipe Snowboard Competition. Yeah! Goodonyer Torah. It rained on and off again yesterday, Saturday. It is muddy and a fair slope where WHEREWILLWEGO is parked. It would not be any fun trying to get it out in all these damp conditions, let alone getting it parked by myself when I return. It would be no fun at Boulder Creek dragging mud into the MH each time I came in and it would be no fun without Donnis. It would be OK if it was fine. The mud and rain just turned me off. Saturday I drove to Mackay to do a bit of shopping and visit daughter Averyl for a couple of hours. As I drove down the highway and also while returning, it was raining and appeared to be raining in the mountains in the direction of Boulder Creek. Perhaps I made the correct decision. On Wednesday and Thursday all staff at the office attended a training session at the Reef Gateway Hotel. Meals provided. None of the staff eat big meals for lunch so on day one we were all surprised to be served a huge steak on a bed of chips with a little salad. I would have been happy with an assortment of little sandwiches. The second day lunch was almost a repeat of the day before only it was a chicken schnitzel instead of a steak. On both days most of the plates went back to the kitchen with half the food still left on them. Now comes the musing part. When I was a kid, you know, from age 11 to 14 or thereabouts, I lived at the Sydney harbour-side suburb of Balmain. It was a poorer working class suburb. I wandered, about as far as a kid that age could wander. Mostly I got around by foot. We were also blessed with buses, trams (trolley cars as they are called in the USA) and ferries. I want to talk about ferries I loved the smell of the harbour, I loved the Sydney Harbour Ferries which could take you all over the harbour-side suburbs. If memory serves me correctly we could travel all day on the ferries for the princely sum of thruppence – Threepence, three pennies, a dina, a trey bit, equivalent to about 2cents in today’s currency. A child day- tripper ticket now costs $9. These lovely old ferries would chug around the harbour picking up and dropping off passengers at appointed wharves, sort of like a bus service. I was restricted by as I could walk on foot to where I could catch a ferry. Mostly I went to Mort Street Wharf. Sometimes I would use Elliott Street Wharf and sometimes I used Darling Street Wharf. I am about to digress from the digression. Dad sometimes took us fishing at these wharves at night. Mainly he used what he called a squid jigg and in those days he used squid for bait. He later discovered from the Italians they are good eating as well. Back to ferries. I mentioned they would chug around the harbour. 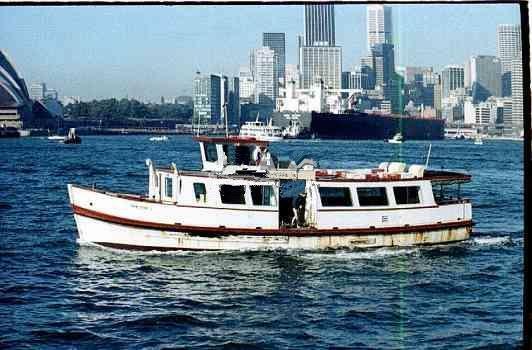 This is the type of ferry I spent a good deal of time when I was younger. Perhaps I had been a passenger on this very ferry. In those days you could see the engine room and see the pistons moving up and down, seemingly in slow motion. In those days a simple piece of rope across an entrance with a handwritten sign on cardboard saying “Keep Out Crew Only” was all that was needed. That and of course your own intelligence which said the engine room was a dangerous place so you watched the engine room from a respectable and safe distance. Not like these days where the sign has to have several warnings, in seven different languages including visual pictographs and the additional scare of a huge penalty. It still does not keep people out. Where did intelligence disappear to in the last 40 or so years? I could catch a ferry from Mort Street and end up at one of the City wharves and go for a wander in the city. I could go all day. I had no food, no water, no hat. Just whatever clothes and shoes I put on in the morning. It sort of just happened with no plan. Sometimes I might spend another penny and come home on the bus. If I managed to catch a bus at peak hour I was not popular with the other working passengers wanting to get home. They and the conductor would let me know this was a workers bus and not for kids. At times I could walk all the way from the city wharf to Circular Quay, the busiest port in Australia with all these harbour ferries coming and going. The big Manly Ferries left from the Quay and it was a wonderful hour or so trip to that beachside suburb way on the other side of the Harbour. On Saturday afternoons you could see the 18’ skiffs racing on the harbour. The Manly Ferry had to cross the Sydney Heads where on one occasion I was carrying a large transistor radio. In those days they were as big as a briefcase and much heavier. On this day a huge swell was rolling in through the heads from a storm out at sea. The ferry starting rolling in the swell and some people were sick. Then waves started to break over our Starboard side. A wave slammed against a window and smashed it, showering glass over passengers sitting there. Now there were screams and more people being sick. The crew came along with brooms and moved people to Port. They then smashed the remaining windows on the Starboard side with their brooms. Better to have some water get in than people getting cut from broken windows. The ferry started to heel to Port and in the process my big, heavy family possession, the transistor radio, slid off the seat and across the deck towards a port door. By now water was sloshing along the port deck and rushing out through the scuppers. My radio was heading towards the deep green sea. I slid after it and managed to grab the handle. As I stood up the ferry heeled even more and I found myself hanging over the gunnels still holding onto the radio even as my feet left the deck. Other passengers grabbed my legs and hauled on-board. Gee was I shaking. Back to ferries in general. Usually the deckie was a short muscled bronzed guy with his Kahki, short sleeved shirt rolled up almost to his shoulders showing off his muscular tanned arms. The deckies all looked the same. When we arrived at a wharf they would lasso the dock stanchions and gradually pull the ferry into place. He would then leap off the ferry onto the wharf and pull a gangplank into place and while holding it in place with his foot, light up a cigarette and ask passengers to walk up the gangplank in an orderly fashion, to watch their step and no pushing. He also took the arms of elderly people, pregnant women, mothers with children and guided them off. He also gave directions to people to find a bus or cab or in which direction to walk. He was a chivalrous guy. At age 13 I wanted to be a deckie. I memorised all the routes and watched everything the deckie did. I reasoned I could do his job easily. Being in the harbour in all weather and the powerful chug chug of the big diesel engines appealed to me. From Circular Quay I could catch a ferry to Luna Park that great amusement park or even to Taronga Park Zoo which in my humble opinion was one of the worlds greatest zoos. A year or two later our family moved to an outer suburb called Riverwood, a long way from the harbour and by the time I left school had no idea what I really wanted to be. Thoughts of the harbour, the ferries and the deckies had faded from my mind. A few years ago I took a trip in a ferry from Darling Street Wharf to Circular Quay then from the Quay to Darling Harbour. Ah, the nostalgia of being aboard a harbour ferry was shocked out of me. The new ferries are faster, more compact and access to crew area are closed and locked and you cannot see the engine. There are warning signs everywhere including the dangers of alcohol and drugs. The deckies were scruffy with long greasy hair, no manners and definitely did not talk to passengers or offer any assistance. When I was a kid the ferries were all owned by Port Jackson Steamship Co but now ownership is by the New South Wales State Government and is part of their transport system the same as buses and trains. Valentines Day is drawing to a close as I write this. My Valentine, Donnis, is in cold Canada suffering from the flu. We only spoke briefly by phone this morning as she is too cold and miserable and having difficulty breathing and sleeping. Her sister Joan has filled her with many natural remedies so who knows they might work otherwise it is off to the hospital for anti biotics – maybe. I think Donnis started to feel unwell after an 18 hour flight from Oz to Vancouver and little sleep then trundling off to sit in a stadium in the cold and watch the Winter Olympics opening ceremony practise. Not to mention another 60,000 people spreading their germs around. Back here in Airlie Beach we have had rain all week. At the beginning of the week it was heavy then followed by a bit of sunlight which raised the humidity levels to uncomfortable again. Later in the week it was rain showers followed by sunlight followed by oppressive humidity. Friday night the rain was more constant, in fact the temperature and humidity dropped. It was 22 in the kitchen, no idea what the humidity level was but it was cool enough to sleep without the AC. In fact during the night I dragged a cotton blanket over myself. In the morning again it was quite pleasant and I thought it would be a nice day to get things done. It was still raining. I went off to do the grocery shopping. While in the shopping centre the sun came out and it was oppressive again. The weekend stayed wet and fine even until tonight when a short shower just passed over. I still managed to re-install the two way radio which was repaired under warranty. It took me an hour of sweating in the front cabin of WHEREWILLWEGO trying thread the radio cable behind the dash. The radio is a separate face and amplifier unit. Finally it was all done, dash screwed back together and it works. I got our neighbour Stan to use a hand held radio to test send and receive. Yeeha! I also managed to get another three overhead lockers fitted with shelves so everything will fit in a bit neater but we can fit in a lot more. I also installed our new quiet Caframo fan above the foot of the bed. It has two large blades with extra soft edges so no damage will be done to fingers. There is no safety cage around the blades as there is with our stainless steel blades on another noisy fan. I read many blogs about people who have travelled around Oz or the USA. Some are travel diaries and the people are back home and finished their travels and others are on the road full time. Some of those other travel blogs can be found on the links on the right hand side tool bar. Some blogs explain how they finance thier trips. Some work until they have enough to move on. Some sold everything and live on the income from investments. Some are retired and have managed to have good super investments and live on their self funded pension. Some are on a Government Pension and have a tight budget. Some saved for the big trip and rely soley on their savings. When the savings run out the holiday ends. Last year I took accumulated leave of 13 weeks and we travelled to Tassie and back. Our big mistake was travelling too far and too fast. We sure would like to do it again only spend more time in many places. I still have Long Service Leave and some accrued leave and would not mind taking another 3 months to travel. We would not travel as far this time. In the immediate future we have a couple of Sugarloafers weekends in February March and April. At the end of April early May we are going to the Wintermoon Festival again. This time for 6 days. WooHoo. Lovin’ it already. Happy Valentines Donnis. Sure hope you are feeling better soon so you can visit your Mum which was the whole purpose of the trip. Last weeks cyclones turned to rain depressions and sent, well, rain to most of the dry and parched parts of Queensland, New South Wales and South Australia. Many outback towns have now experienced floods as have many coastal communities. A by-product of the rain is humidity. Even on cloudy days, in fact it is more so on cloudy days, the temperature is still around 35 ° but beneath the cloud cover the damp evaporates and is called humidity. Weather forecasters refer to it as “oppressive humidity” and it gets oppressive unless you are in air conditioned buildings and cars. Our house is insulated in the roof, the outer walls have a roofed verandah and we have shade blinds and awnings to keep the sun off the walls. While it is 35 ° outside it is still 28° degrees inside. At present I have all the ceiling fans and one large mobile fan working all day to push the air around and create a semblance of a cool breeze. At night I always turn on the bedroom AC to get a good nights sleep. Saturday was the last day Donnis and I had together before she flys out to Canada. Today, before she left she discovered she can get a ticket to the 2010 Vancouver, Canada Winter Games Opening Ceremony. She has asked her sister Linda to try to buy a ticket. Alas Donnis plans on spending most of her time sitting with her mum so a short break to the opening ceremony would be an opportunity too good to miss. I sure hope she picks up a ticket. Now back to Saturday. As a last day together I suggested we travel to Bowen almost an hour north of Airlie Beach. So we drove to Bowen then a little out of town to Flagstaff Hill Restaurant and Interpretive Centre. While we were driving along the main street of Bowen Donnis asks me to go to the bakery for a couple of her favourite treats – Vanilla Slices. The bakery is closed, it is 12 .30 pm. WTF! OK we head off to the the next bakery who have huge billboard advertising on the roads leading into Bowen, proclaiming their terrific bread, fantastic pies, fabulous cakes and pastries and the best sandwiches in town. By now Donnis is drooling thinking of her Vanilla Slice fix. They too are closed. In fact their sign says “We are going on two weeks holiday commencing today!” This is not good but next stop is the restaurant on top of the hill with 360° degree views. I was planning what I would have for lunch, including a cold beer as we drove up the steep, narrow and winding road to the top. Remember it is hot hot hot outside. So we arrive at Flagstaff Hill and there are no cars in the carpark and chairs are piled on top of tables. The restaurant is closed! Although we could get out of the AC car and take photos, lunch was becoming a more pressing requirement. It is 1.40pm and I know from past bitter experience most eating houses in Australia close the kitchen at 2 pm. We must make a choice. Hightail it back into town to one of the fancy pubs or take a chance driving the other way to Horeshoe Bay in the hope the on the beach restaurant is open. Arriving at Horseshoe Bay we sight a big red “Sorry we are Closed” sign hanging in the window. WTF!!! I am getting hungry and longing for a cold beer so again we are in hightail mode this time heading to a pub in the main street of Bowen but near the bay. We park, walk inside at precisely 2.05pm and the kitchen counter has the shutters down and a sign “Kitchen Closed. By now we are pretty depressed. And annoyed. We passed another three hotels on our way to a known food outlet which will not be closed. I know those hotels have also closed their kitchens. We arrive at Subway and WTF they have discontinued our favourite bread – Parmessan Oregano. What the heck. We have a sub and share a Fanta with ice for our lunch. Poor substitute for our our original plans but not not bad either and all it cost was $11.20 to feed both of us. After lunch we had a half hour to kill so headed back to Horseshoe Beach to take a couple of photos. 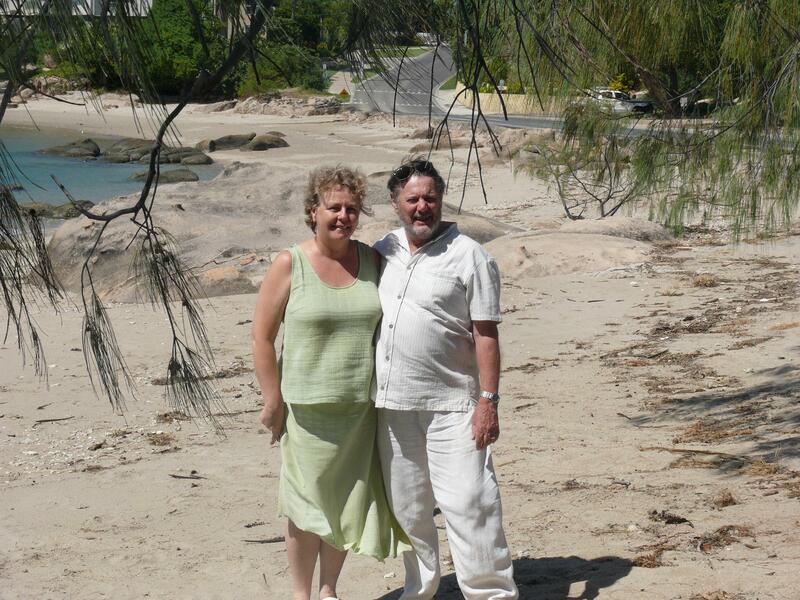 Frank n Donnis on the beach at Horseshoe Bay, Bowen. Then it was off to the Bowen Summergarden Movie Theatre. Going to the movies here is an experience everybody should have at least once in their life. Originally it was an open air theatre at this seaside tourist town (which incidentally was originally planned to be the capital city port of Queensland.) Eventually the theatre was enclosed and roofed. There are two screens. One is a little theatre such as are found in cinema complexes where there are 10 screens. The other, older, original theatre is quite wide. The floor is made from what seems to be sprayed on rubber. There are three classes of seating (all one price). At the front is the old fashioned canvas deck chairs. A little way back are the 40′ and 50’s style of seats with the fold up seats and at the rear is the more modern seats with drink holders built into the armrests and armrests which can be folded up and out of the way. The sound system is as good as any modern city cinema. Along the walls at the sides are plynths with busts of Roman Emperors and Greek demi Gods. Just sitting and waiting for the movie is an experience. But wait… there’s more. Ben who owns the theatre and has done so for many years greets everybody before each performance and is there at the end of the movie to say see you again etc etc etc. I have been going to this cinema for about 13 years and he is always there to greet us and remembers us. He might not know our names but he remembers our faces. Now that is worth the price of admission which at $9 is not a bad deal. The cinema was featured in the movie AUSTRALIA and the world premiere was held here. We saw the movie at this theatre also. Despite the closed shops the Bowen Summergarden Theatre was the highlight of our day in Bowen. Today I finished cutting the grass which was mostly 30cm tall since I cut it two weeks ago. I also cut some more shelves for the motorhome. Then I drove Donnis to the airport to catch the first of three flights to Canada to visit her sick mum. That brings us to the poor lonely Frank part of the title. Although I will be too busy to be lonely. I have work. Then I have cooking, cleaning, washing, ironing, making the bed, looking after Ziggy the bird and all the things I usually do. Oh and of course keeping this blog up to date and reading all the blogs I normally read.